With DiskGenius, you can recover deleted and formatted files as well as recover missing or corrupted partitions. It supports RAID recovery and sector edit. Besides, DiskGenius is a powerful partition manager program which can create, format, resize, extend, shrink and backup partition. 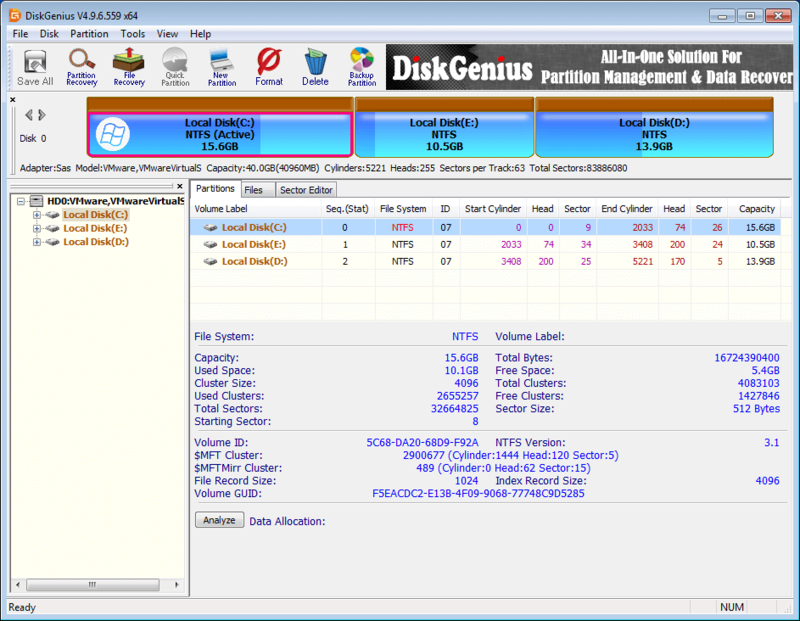 Numerous disk utilities are provided by DiskGenius, such as Quick Partition, Disk Clone, Permanent Deletion, etc. It's Windows 10 compatible. Please contact us with the contact form to report difficulties, strange behaviors or persistent problems, and quote the program name or the number 23021 . This is the download page for DiskGenius Free - DiskGenius is a powerful tool for data recovery, partition manager and partition backup, for it provides lots of functions.Partition Management - It can create format, resize, extend, backup, split, hide and clone partition, both MBR and GPT are supported.Disk and partition conversion - Convert dynamic disk to basic, convert virtual disk format and convert MBR to GPT, convert primary partition to logical, etc.File recovery - It can recover files deleted or emptied form recycle bin, recover files from damaged partition or disk and recover files by file type and supports file preview and file filter.Partition recovery - It is the best partition recovery program in that it can recover files from damaged, corrupted and RAW partitions, search for lost partition and recover files from it, besides, it can fix partition table.RAID recovery - It can reconstruct Virtual RAID and recover files from it, and all RAID types are supported.Sector Editor - A Hex editor is embedded to help users edit raw hex data and recover data manually.Backup and Restore - It can backup and restore partition including system partition, hard disk and partition table.Bad Tracks - It can check and repair bad sectors for all storage devices; check hard disk S.M.A.R.T. information.Delete files permanently - It can delete files permanently so that they can't be recovered by any data recovery software.Virtual Disk - It supports virtual disks, including VMware, Virtual PC and Virtual Box.Create WinPE bootable disk and you can manage disk partition when system crashes or there is no operating system on your computer.Support FAT12/FAT16/FAt32/exFAT/NTFS/EXT2/EXT3/EXT4 file system format.